In this common joseki, Black has just jumped one space, moving "quickly" and low along the upper side. Compared to a move at a, is loose. 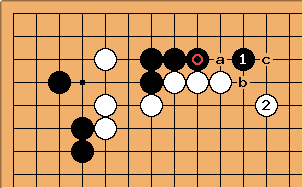 White could play at b, but after Black c, White would be "behind." For this reason, White should play keima at , a loose move compared to b. Loose plays are not always thin, and tight plays are not always thick. Chris Hayashida: You might want to consider using other terms, too. I've seen these plays referred to as fast. unkx80: I think fast moves tend to be loose.